Photograph, Portrait of Waller T. Burns. Courtesy of the Legislative Reference Library of Texas. Image available on the Internet and included in accordance with Title 17 U.S.C. Section 107. BURNS, WALLER T. (1858–1917). 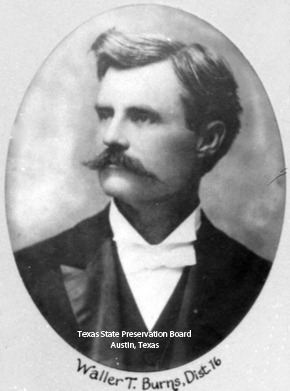 Waller T. Burns, lawyer and legislator, son of James Randolph and Adelia (Thomas) Burns, was born in Fayette County, Texas, on January 14, 1858. He was admitted to the bar in 1882 and practiced law in Galveston until 1888, when he became attorney for the Houston and Texas Central Railway. In 1882 he married Maggie Evelyn Killough of La Grange; they became the parents of three sons. His second wife was Grace McLemore Willis of Houston, whom he married in 1913. Burns was a delegate to the Republican national conventions in 1884 and in 1892. As senator from the Sixteenth District in the Twenty-fifth and Twenty-sixth Texas legislatures, 1897 to 1901, he was one of the few Republicans ever elected to the Texas Senate from a Democratic district. In 1902 he was appointed United States district judge for the Southern District of Texas. While holding court in Laredo, he became suddenly ill and died, on November 17, 1917. He was buried in La Grange on November 19. Burns was an Episcopalian and a longtime supporter of the Houston Bar Association. Benajah Harvey Carroll, Jr., ed., Standard History of Houston, Texas, from a Study of the Original Sources (Knoxville, Tennessee: Crew, 1912). Houston Post, November 18, 1917. E. H. Loughery, Texas State Government (Austin: McLeod and Jackson, 1897). Proceedings of the Texas Bar Association, 1918. Ocie Speer, Texas Jurists (Austin, 1936). Handbook of Texas Online, "BURNS, WALLER T.," accessed April 18, 2019, http://www.tshaonline.org/handbook/online/articles/fbu56. Uploaded on June 12, 2010. Modified on September 28, 2016. Published by the Texas State Historical Association.